The esophagus (food pipe) is the tube that connects your throat to your stomach. Varices are enlarged veins that may be found in the esophagus in people with cirrhosis of the liver. These veins may rupture and bleed. Scarring (cirrhosis) of the liver is the most common cause of esophageal varices. This scarring cuts down on blood flowing through the liver. As a result, more blood flows through the veins of the esophagus. The extra blood flow causes the veins in the esophagus to balloon outward. Heavy bleeding can occur if the veins tear. Any type of long-term (chronic) liver disease can cause esophageal varices. 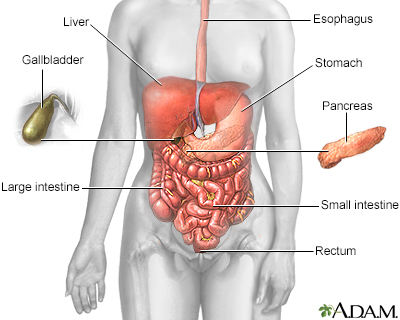 Varices can also occur in the upper part of the stomach. People with chronic liver disease and esophageal varices may have no symptoms. If there is only a small amount of bleeding, the only symptom may be dark or black streaks in the stools. EGD or upper endoscopy, which involves the use of a camera on a flexible tube to examine the esophagus and stomach. Insertion of a tube through the nose into the stomach (nasogastric tube) to look for signs of bleeding. Some providers suggest EGD for people who are newly diagnosed with mild to moderate cirrhosis. This test screens for esophageal varices and treats them before there is bleeding. The goal of treatment is to stop acute bleeding as soon as possible. Bleeding must be controlled quickly to prevent shock and death. If massive bleeding occurs, a person may need to be put on a ventilator to protect their airway and prevent blood from going down into the lungs. A clotting medicine may be injected into the varices. A rubber band may be placed around the bleeding veins (called banding). A medicine to tighten blood vessels may be given through the vein. Examples include octreotide or vasopressin. Rarely, a tube may be inserted through the nose into the stomach and inflated with air. This produces pressure against the bleeding veins (balloon tamponade). Drugs called beta blockers, such as propranolol and nadolol that reduce the risk of bleeding. A rubber band can be placed around the bleeding veins during an EGD procedure. Also, some medicines can be injected into the varices during EGD to cause them to clot. Transjugular intrahepatic portosystemic shunt (TIPS). This is a procedure to create new connections between two blood vessels in your liver. This can decrease pressure in the veins and prevent bleeding episodes from happening again. In rare cases, emergency surgery may be used to treat people if other treatment fails. Portacaval shunts or surgery to reduce the pressure in the esophageal varices are treatment options, but these procedures are risky. People with bleeding varices from liver disease may need more treatment for their liver disease, including a liver transplant. Bleeding often comes back with or without treatment. Bleeding esophageal varices are a serious complication of liver disease and have a poor outcome. Placement of a shunt can lead to decrease of blood supply to the brain. This can lead to mental status changes. Call your provider or go to an emergency room if you vomit blood or have black tarry stools. Treating the causes of liver disease may prevent bleeding. Liver transplantation should be considered for some people. Savides TJ, Jensen DM. Gastrointestinal bleeding. In: Feldman M, Friedman LS, Brandt LJ, eds. Sleisenger and Fordtran's Gastrointestinal and Liver Disease: Pathophysiology/Diagnosis/Management. 10th ed. Philadelphia, PA: Elsevier Saunders; 2016:chap 20. Weinberg AJ. Esophageal varices. In: Ferri FF, ed. Ferri's Clinical Advisor 2018. Philadelphia, PA: Elsevier; 2018:475.e2-475.e2. 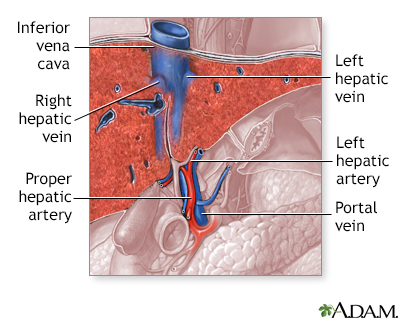 The proper hepatic artery supplies blood to the liver.